A proposal brewing in the legislature would try to involve Linn or Benton County in the planning and financing of a third Willamette River bridge in Salem. State Rep. Paul Evans, D-Monmouth, announced the idea on Friday in a press release issued by his Capitol office. 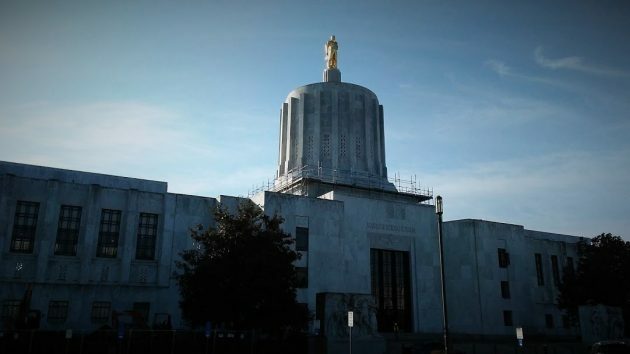 He said he had introduced a bill, HB 2974, that would authorize the formation of a bridge district covering the “Capital City Region” consisting of Linn, Marion, Polk, and Yamhill counties. As of Saturday the bill had not been made available on the legislature’s website, so its details are obscure. The Statesman-Journal in Salem quoted Evans to the effect that the text was still undergoing changes. For instance, the paper quoted the legislator that Linn County may be taken out and Benton County put in. That would make more sense, as Benton County residents are more likely than people living in Linn, on the east side of the Willamette, to cross the river to get to the capital. Evans came out with his press release after the Salem City Council on Feb. 11 voted 6-3 to stop a 13-year planning process for a third Salem highway bridge. Some $6 million, including $5.2 million in federal highway funds, had already been spent on the project. According to press reports, cost estimates for the bridge itself, with two lanes each way, ranged upward of $400 million. Evans said his proposed district would be allowed to levy property taxes for the purposes of planning, financing, building, operating, and maintaining bridges over the Willamette in the Capital Region. It’s not clear whether this would require elections in each county on either the formation of the district or the imposition of taxes, or both. He didn’t say whether the district would be authorized to support bridges in places other than Salem. This would be of some interest in Albany, where there’s been years of talk but no action about planning a bridge from north Benton County to Interstate 5 via Conser Road in Millersburg. Evans’ proposed bridge district would be governed by a five-member board, one elected from each county and one appointed by the governor or elected at large. The Salem River Crossing project had been promoted, especially in West Salem, as a way to relieve congestion. Opponents fought it because of the disruption of street patterns and neighborhoods it would cause on the east side of the river in Marion County. Linn County. The folks in Linn County are already on the “other side” of the river, and unless they are using highway 20 to/from Corvallis, they do not have nearly the hassle that North Albany does. Would most people in Linn County even support it, given the above issue, and natural reluctance to additional taxes? Additional bridge capacity is desperately needed, regardless! Don’t be fooled by those Salem City Slickers. They’ve been testing the financing waters for decades, ever since West Salem was oversold, overbuilt and under-bridged. With Linn County officialdom facing-off against the Albany City Council, the West Salemites hope to use the distraction for extraction of Linn County tax dollars to pay for a third bridge into Salem’s burgeoning downtown. Once that span is built, this whole statute will be conveniently ignored. Don’t buy Paul Evans’ 76 Trombones. I’m thinking they need a toll bridge for those who use the thing. A novel idea the Salemites have not discussed. Maybe a privately built and operated bridge such as they do with freeways back East. For the cost of a couple of bridges, you could support 10-minute bus service between Albany and Corvallis around the clock for years. Commuters could avoid the hassled bridge crossing and traffic flow would improve accordingly. Building more lanes brings more congestion, not less. I’ve heard liberals state buildimg more lanes causes more congestion so many times but I have never had a rational explanation of the term. Perhaps you could enlighten us! I’m sure if they widen I-5 through Albany congestion will increase dramatically. First time I heard it was from Republican regarding the freeway development in SOCAL. More lanes brought more cars. That was observed data. Just a guess — car ownership grew faster than anyone had planned for. I was born and raised in Salem, now living in Millersburg. That 3rd Bridge has been discussed for decades and just rejected last month by Salem’s Council. There is a large pro and anti Bridge movement in Salem. Granted a third bridge is needed and overdue. On Salem forums I have repeatedly asked the “Pros” how they plan to pay for a $400 million dollar bridge (probably a lot more by the time one is built) and if they would appreciate a huge increase in their property taxes. Never a response ! So now they are looking where they can get the money…lets go to the wallets of adjacent counties. I quote, “Evans said his proposed district would be allowed to levy property taxes for the purposes of planning, financing, building, operating, and maintaining bridges over the Willamette in the Capital Region.” I say hell no ! That third bridge in downtown Salem would have little effect on Linn County residents other than the taxes they would pay. He wants to develop a “Bridge District” but then also states, “He didn’t say whether the district would be authorized to support bridges in places other than Salem.” So if we need another bridge here (such as through Millersburg), he wont commit that the District would pay for it. THEY WANT OUR MONEY !!! Plain and simple. Keep your eye on the ball tax payers. Salem, you want a Bridge ? You can pay for it with City, State and Federal dollars. Any Linn County politician supporting such an idea should face a recall. How was your property tax bill in November ?! I understood from a good source that the bid for Corvallis has been let and will start next summer. Any truth to that? It would only service a small percentage of people that live in Salem but everyone gets stuck with the bill. Also it’s designed on a liquefaction zone which the west Salem people who are for it seem to ignore. Increased property taxes, car registration and gas taxes, there’s already a major homeless problem here why make it worse by taking more money from people that are already struggling. Quote from above: “Some $6 million, including $5.2 million in federal highway funds, had already been spent on the project.” So if they can spend 5.2 Million & scrap it, no way do they deserve one cent from Benton or Linn Co. for Marion. We have our own infrastructure list of to-do projects. No way, Salem.